Some scoff at the idea that face-covering Islamic veils endanger public safety in any Western nation, let alone the United States, but Philadelphians do not have the luxury of blissful ignorance. As recent events highlight, their city has become the American epicenter of robberies and murders carried out by criminals disguised as fundamentalist Muslim women. Several factors help explain Philadelphia's place at the forefront of this trend. Will other U.S. cities be next? The latest wave of burqa banditry to target Philadelphia began at a branch of More Bank in the East Oak Lane neighborhood two days before Christmas. Following similar heists on January 6, March 14, March 20, and April 4, the Philadelphia Police Department and FBI issued a wanted flier for a pair of black males in "Muslim-like clothing covering their heads and bodies." 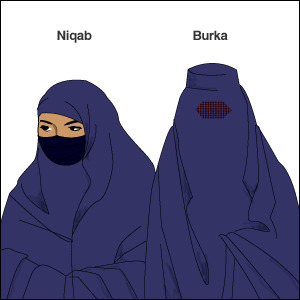 Surveillance images indicate that the outfits include face veils (niqabs) and "burqa-like robes," to quote one news item, leaving just the eyes visible. The same Wells Fargo branch struck on April 4 was then hit again on April 13, after which Muslim groups offered $20,000 for information leading to the perpetrators. No arrests or further bank robberies have been reported.